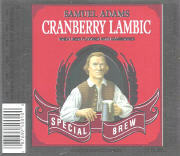 Seasonal lambic (by definition: wheat beer with fruit added) soaks cherry-soured rhubarb pie tartness, sweet Scotch warmth, and thickening dry hop bittering with pureed cranberry piquancy. But its dredged maple flavoring seems lost in cornmeal midst. Hmmm.